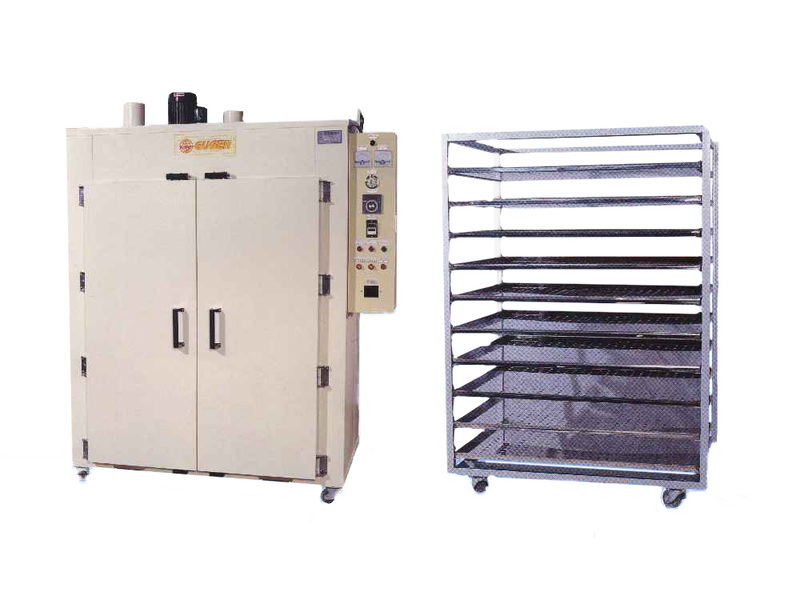 CART TYPE OVEN (Two Door)(WE-9114-2 / WE-9114-A) - Guger Industries Co., Ltd.
1.style:Horizontal blow type, cart Two door for open and the control box in the right side. 2.Material :steel plate with "L" steel. 3.Keeping temperature:6side keeping temperature with rock cotton. 4.Control way: ON/OFF control.Setting the desired temperature and time. when it reaches the temperature, the timer will count down and keep the temperature and the system will auto turn off when the time is up. 5.control part: Digital thermometer, electric timer(999M), magnetic contactor, heater switch, motor protect switch, power switch, voltmeter, ammeter, EGO overheat protector. 11. Coating: inside->heatproof silver coating; outside-> double top coating. 3.Cooling motor :AC 1HP motor with fan. 1.Type: Availble for cart type oven. 3.Rack material: coated angle steel. 4.Layer:10 layers, the layer separation is 12cm. 5. Caster: 4 Pcs 4" casters. 6. Coating : Heatproof sliver coating. 8.Tray material: 430 stainless steel.